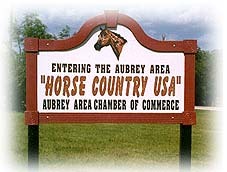 Located in the heart of "Horse Country USA", Aubrey, Texas is situated on U.S. Highway 377, in Denton County. This rural community of 1500 is just minutes away from Lake Ray Roberts and major shopping and businesses in Denton, Frisco and Lewisville. Aubrey is served by the Aubrey Independent School District. The high school mascot is the chaparral (roadrunner). If you prefer the rural atmosphere, enjoy equestrian pursuits, or just want a nice place to live near but away from the hustle and bustle, add Aubrey to your list of North Texas places to consider. Browse the homes below or use our advanced North TX MLS search tools to find available properties in this pretty town.